A guidebook to walking in central Switzerland, Europe. Few regions of the Alps contain greater contrasts than Central Switzerland. The shores of the riviera-like Lake Lucerne and the ice-clad peaks of the Winterberg massif are a world apart, yet both are scenically spectacular and have magnificent walking country nearby. This guidebook reveals secluded corners of rarely-trodden as well as better known valleys, along lakeside pathways and across lofty ridges with stunning views. Here is a mountain region with vast potential for the walker and all who love fine scenery. Lucerne, Brunnen, Altdorf, Andermatt and Engelberg have no shortage of accommodation - of all standards - but there are also numerous other villages and remote alp hamlets, that offer overnight lodgings in the peace of the mountains. 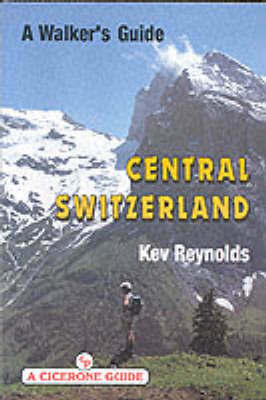 Kev Reynolds describes the villages, valleys and mountains of Central Switzerland, and provides 90 of the region's best walking routes that will lead to some of the finest views in all the Alps. This guidebook is for use by walkers who may never have ambled through an alpine valley before, as well as the more experienced mountain trekkers aiming for the high cols and inner recesses of glacier-hung peaks. Something for everyone.